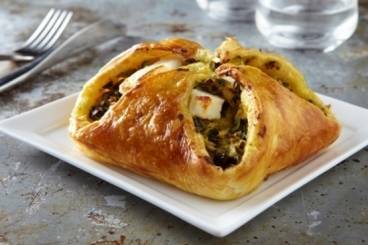 Crisp and light puff pastry parcels filled with courgette, fromage frais and olives. Wash the courgettes and cut into thick slices. Pit and roughly chop the olives. Peel and finely dice the garlic. Break the egg into a bold and beat with a fork. Heat a frying pan and add the olive oil. Add the courgette to the pan and sauté with the garlic for 3 to 5 minutes. Once the courgettes have started to take on a little colour, seasaon with salt and pepper. Remove from the heat and crush the courgettes with a fork. Add the fromage frais and the olive and combine well. Spoon the mixture into the centre of each sheet of puff pastry. Lift the corners of the pastry and folder towards the centre in the shape of a pyramid. Pinch the corners together and then brush the beaten egg on to the pastry. Place on a baking sheet, transfer to the oven and bake for 15 to 20 minutes. The pastry should be crisp and golden brown. Allow to cool slightly before serving with a crisp salad.